This miniature wooden table has been lacquered in black and inlaid with pearl shell in a dense and extremely fine scrolling leaf pattern amid which small birds and squirrels can be seen. 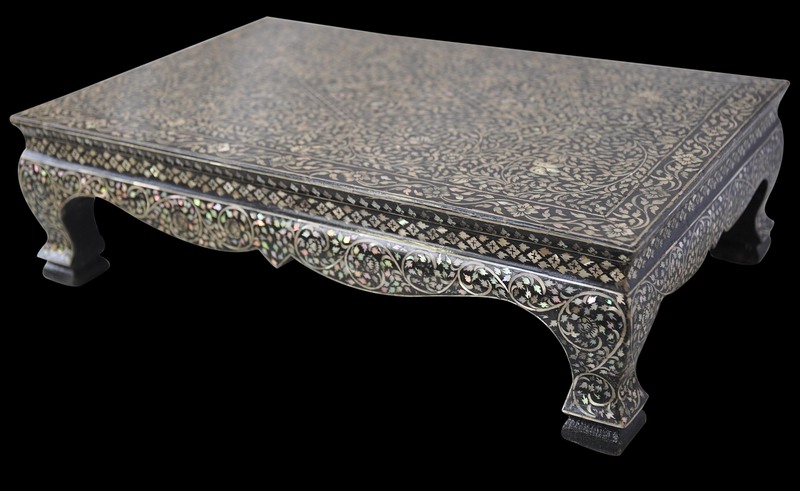 The inlay work completely covers the table top, the legs and the skirt. The table is rectangular and sits on four cabriole legs. The table is in fine condition with no losses, and only minor shrinkage cracking. 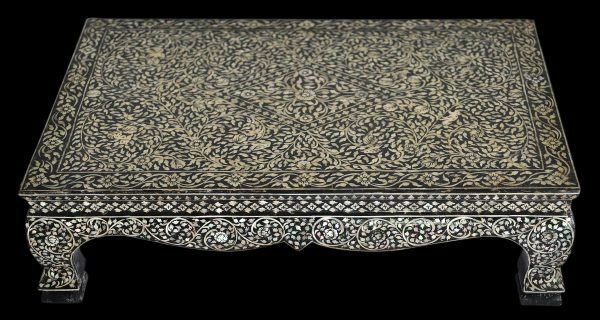 It has clear age and a dating of at least the nineteenth century seems reasonable both in terms of the quality and fineness of the inlay work and from the patina. 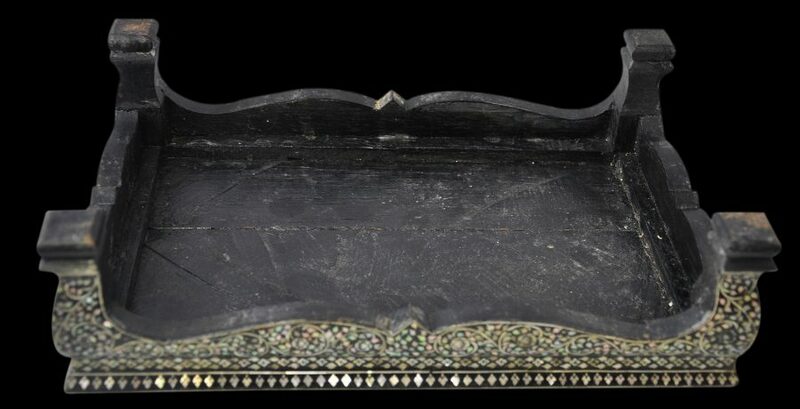 Such small table were used in temples and on altars to support vases and other decorative elements. Typically, the shells (turbo and trochus) from which the shell inlay used in Thai mother-of-pearl inlaid lacquer work came from the coral reefs along the coast of Phuket and Surat Thani Provinces in the south of Thailand, and Chanthaburi and Trat Provinces of the east. 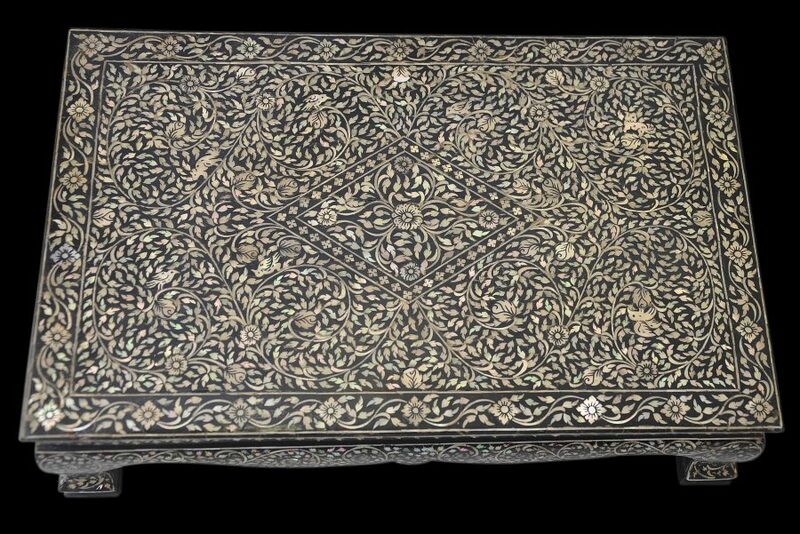 Thrones for kings and palace and temple doors were among the larger items lacquered and inlaid with pearl shell. 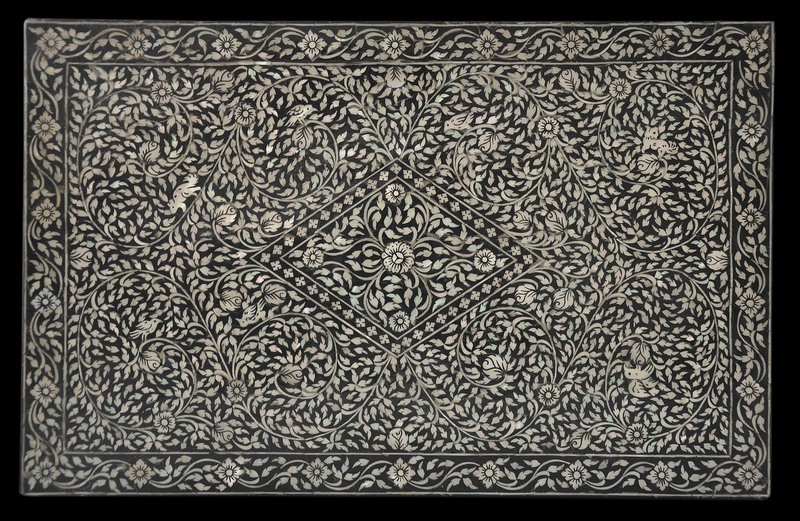 During the early Bangkok period (1782-1824), mother-of-pearl inlay work was so popular that high-ranking members of the royal family were appointed to oversee its production in a bureau known as ‘the Department of Mother-of-Pearl Inlay’ (McGill, 2009, p. 200). But by the end of the nineteenth century, the art form started to lose its popularity as Western styles came more into vogue. The Department was closed down in 1926. Byachrananda, J., Thai Mother-of-Pearl Inlay, River Books, 2001.